Point Reyes Station’s annual Path of Lights, which includes sidewalks decorated with luminaria and the lighting of the town Christmas tree (between Wells Fargo Bank and the Palace Market) will be held this Friday evening, Dec. 3. 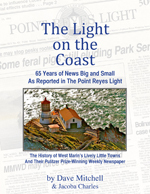 The festivities will include contributors to the new issue of The West Marin Review (Volume 3) signing copies at Point Reyes Books from 5 to 7:30 p.m. More about that in a moment, but first a word from our sponsors. 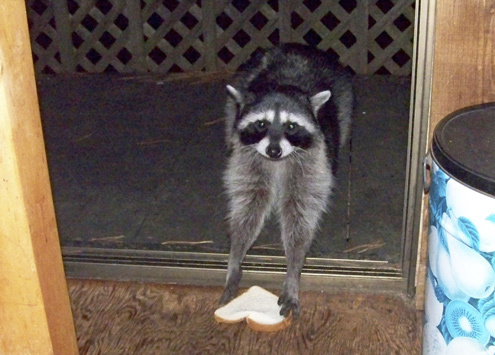 A raccoon friend of mine for the past several seasons picks a slice of bread off my kitchen floor Monday. 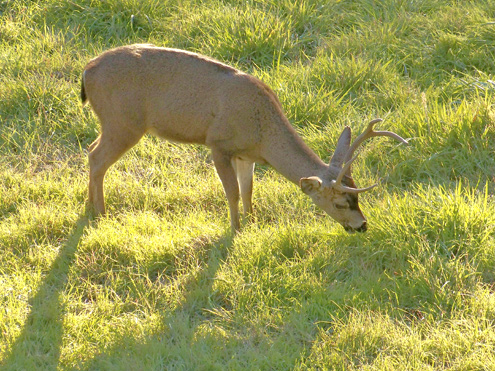 Also on Monday, a blacktailed buck grazes just below my deck as a doe and a couple of fawns graze nearby. Four roof rats show up on my deck Sunday to share in the birdseed I put out for my feathered friends. 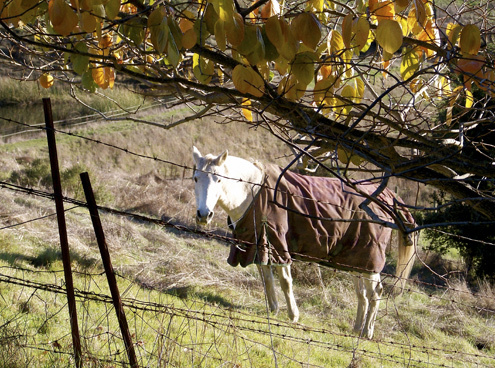 One of the Point Reyes Arabians looks over my fence from beneath a persimmon tree Monday. In the upper left is a stockpond belonging to the Giacomini family. 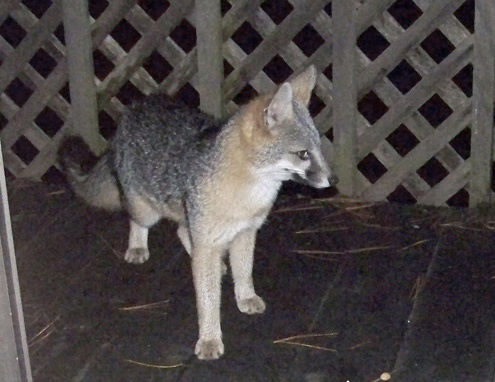 Grey fox on my deck last week shows no reaction when I use a flash to photograph him through an open door. 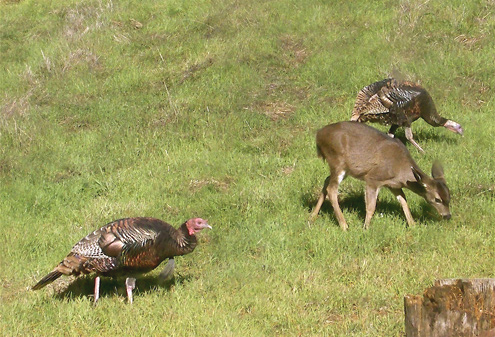 Wild turkeys eating with a blacktail fawn. Perhaps “birds of a feather flock together,” but they also flock with other creatures, as seen Sunday out my kitchen window. And now back to the news. As the West Marin Review website notes, “In [the new] volume are Jonathan Rowe’s provocative, urgent essay about the future of irreplaceable places and Elia Haworth’s sweeping history of the farmers who settled in the area. 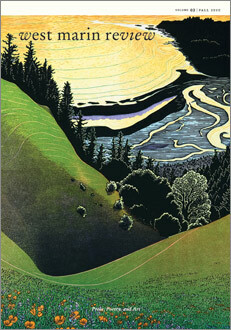 “The beauty of West Marin is evoked in vivid, colored woodblock prints by Tom Killion, in line drawings, watercolor, and photographs, in precise rendition and in abstract design. “Some of the poetry is site specific — but The Review is not exclusive to West Marin. It seems that ‘place’ — wherever it is — is always a source of creative inspiration. Many of the essays and poems refer back to earlier homes, earlier times and lives. The list of contributors to The West Marin Review is generally impressive, and many of them will be on hand to sign copies at Point Reyes Books. Although not particularly impressive myself, I’ll be among those with pen in hand should anyone want my autograph. Sparsely Sage and Timely is powered by	WordPress 4.9.10 and delivered to you in 0.600 seconds using 54 queries.